For one reason or another, we all seem very interested in “age”. Of course, age is quite important to most of us, as this seemingly innocent number in many ways works to determine the choices and possible actions available to us. In the same vein, the expectations from our surroundings are also very much related to our age, further reducing the array of probable priorities. For instance, until recently we were not expected to play video games as soon as we outgrew the status of teenager. This has luckily changed, as described in an earlier post, making it feasible for people like me to keep playing. Great. Just as it is the case with games, certain expectations have been tied to the users of social network sites like Facebook. There is no reason to believe, however, that primarily the younger adults are frequently visiting this modern day agora. 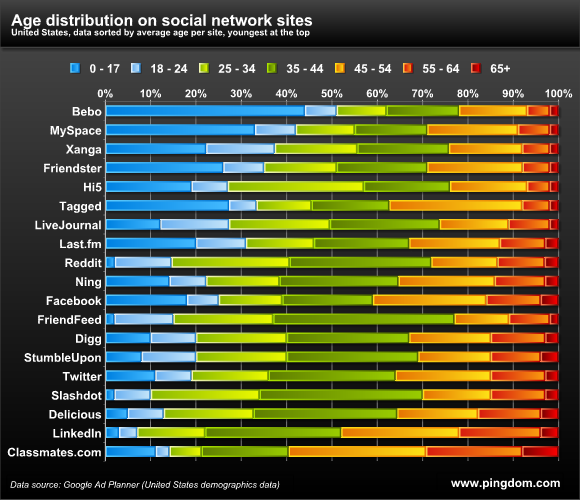 The study “Ages of social network users” shows, that the primary age group across social network sites is the interval 35-44. 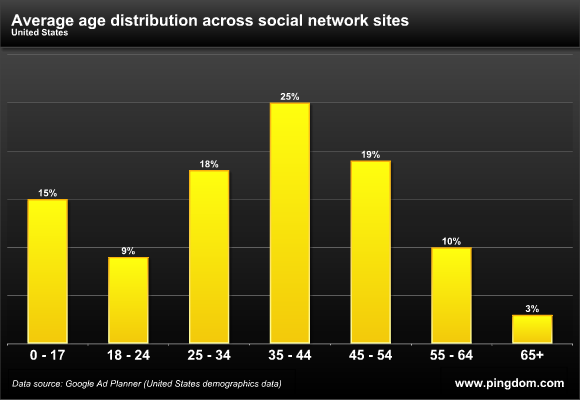 61% of users on Facebook are 35 or above, and the average user is 38. 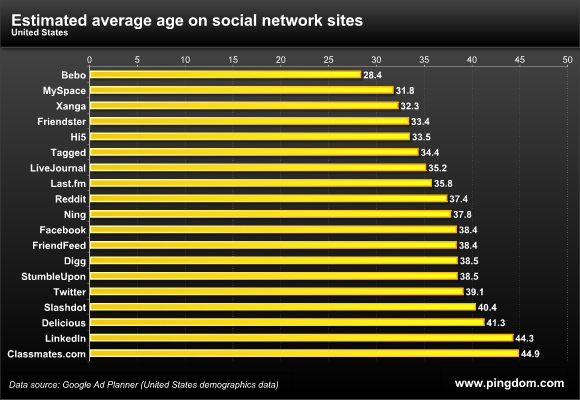 Demographic data are important from a commercial perspective, because they allow marketing departments to decide upon relevant network sites, and more accurately target their users. To me, it is just plain interesting to know what is going on at the different sites, and who is visiting them. Well, take a look for yourself over at Royal Pingdom.